Home › Life in Christ › Tuesday Morning: 29 Jan 2019 – John 7:37-52 ~ The promise of living water. Tuesday Morning: 29 Jan 2019 – John 7:37-52 ~ The promise of living water. When the crowds heard him say this, some of them declared, “Surely this man is the Prophet we’ve been expecting.” Others said, “He is the Messiah.” Still others said, “But he can’t be! Will the Messiah come from Galilee? For the Scriptures clearly state that the Messiah will be born of the royal line of David, in Bethlehem, the village where King David was born.” So the crowd was divided about him. Some even wanted him arrested, but no one laid a hand on him. “We have never heard anyone speak like this!” the guards responded. Then Nicodemus, the leader who had met with Jesus earlier, spoke up. “Is it legal to convict a man before he is given a hearing?” he asked. who would be given to everyone believing in him. + The Holy Spirit satisfies the deep longing (thirst) of human hearts to know God. + The blessing of the Holy Spirit was apportioned to those chosen by the Father at this point in the story. + The blessing of the Holy Spirit was given as a wellspring (river) to every believer in Jesus after his death, resurrection and ascension (entered into his glory). Do you consider yourself a believer in Jesus Christ? Please explain. 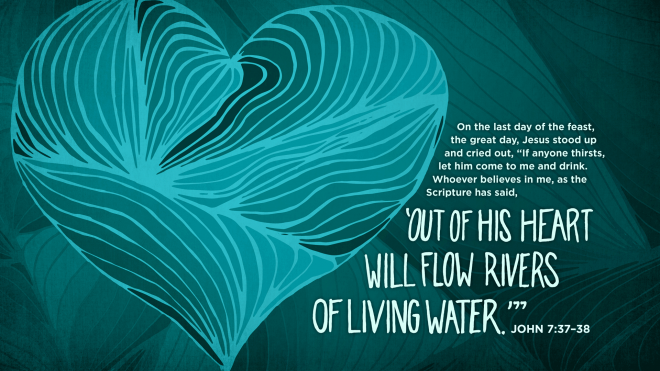 Does “Rivers of living water will flow from his heart” describe you? How have you experienced the blessing of the Holy Spirit in your life? How has the blessing of the Holy Spirit you received been a blessing to others? Sovereign God: Send your Spirit into our unbelieving world to call people in every tribe and nation to faith in Jesus Christ, that all may confess him as Lord. And pour out your Spirit on your Church in all its shapes and forms, that we may be one in him – an ever-flowing source of healing, and a certain hope of eternal life. We ask this in Jesus’ name.